News for Week 2 of Mar 2014; the biggest news was the report that Bitcoin creator, Satoshi Nakamoto has been found which turned out to be controversial. PR - Apr 4, 2014 - Gaming: Moon Dance! Latest Malaysian Made Mobile Game!! Moon Dance is a simple, fun, quick and exciting game for the whole family. The aim of the game is to keep dancing and to keep the Astronauts dancing as well! Tap them and they will jump to the beat. Just remember not to let them fall! Challenge your friends and family members and be the best Moon Dancer in the world!! The aim of the game is last as long as you can! Getronics, an ICT services group announced that it has achieved the Cisco Cloud and Managed Services Advanced Certification. This certification recognises Getronics and its capabilities in selling and delivering cloud and managed services to help accelerate time to market and time to revenue. Additionally, the certification rewards partners for their expertise and investments for creating, selling and delivering cloud and managed services with financial incentives and go-to-market benefits in all countries of legal presence. 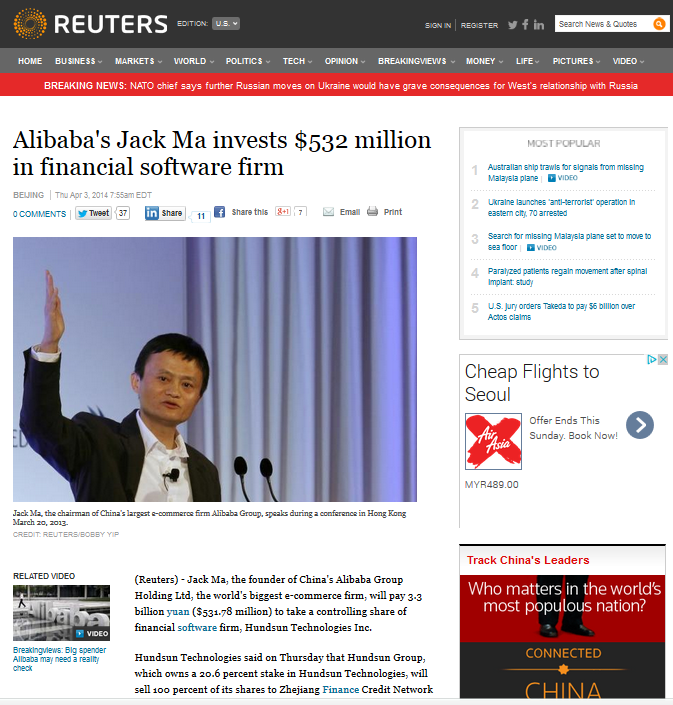 Reuters reported that co-founder of Alibaba Group, Jack Ma, will invest into financial software firm, Hundsun technologies. Words have it that the Jack Ma is interested in the wealth management product line of Hundsun which supports selling of wealth products directly to consumers. According to the report, Hundsun Group will sell all of its 20.6% of stake in Hundsun Technologies to Jack Ma. By Matthew Howett, head of Ovum’s telecom regulation practice. After months of in fighting, heated exchanges, and extensive lobbying by the industry, the European Parliament has just passed an important vote to adopt the EC’s Connected Continent package albeit some fundamental amendments. In the last few weeks, the entire package of measures risked being dropped because of the contentious issue of net neutrality. Matthew Howett commented that “At the heart of the net neutrality debate is whether fixed and mobile operators should be able to charge more for different levels of Internet access and prioritise certain traffic over others. Telcos fear that they wont be able to invest to meet future bandwidth demands unless they are able to better monetize the access they offer. On the other side of the coin, Internet companies fear that start-ups , consumers and innovation will suffer if there is a further movement away from the current ‘best efforts’ nature of the Internet. In reality, the truth is probably somewhere in the middle. “The question now is whether operators feel they can work within the scope of the regulation to offer the services they plan to - a last minute lobbying effort to remove some of the wording of what constitutes such services suggests not. The fear exists around whether even basic (and generally accepted), forms of traffic management will be permissible under the Commissioner’s vision for an ‘open Internet’. Fusion-io today announced NVM Compression, a flash-aware interface that can double the useable capacity of ioMemory flash while eliminating the performance impact associated with disk-era compression algorithms commonly used with flash SSDs. When integrated with the Atomic Writes interface, NVM Compression also delivers 4x more flash endurance by streamlining commands to optimize databases for persistent flash memory architectures. With traditional disk storage, data compression significantly hinders database performance. 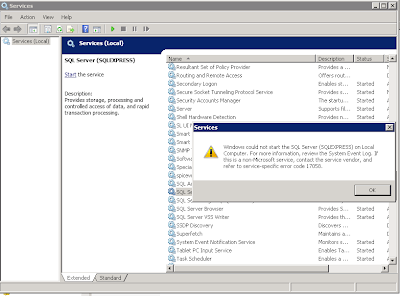 Testing conducted by MariaDB database developer SkySQL showed that using the NVM Compression interface with the Fusion-io nonvolatile memory file system (NVMFS) doubled the useable capacity of the ioMemory server flash available to the database without affecting performance. Pivotal, an EMC business built to enable the creation of modern software applications that leverage big and fast data, announced a suite of enterprise-class, advanced set of technologies that fully support Apache Hadoop and HDFS to deliver a unified set of capabilities grounded in over three decades of expertise, development, and market leading data management and analytical intelligence. It allows customers the flexibility of choice and price to access to Pivotal’s Hadoop Data Platform among several other big data and data intelligence capabilities. CA Technologies today announced that Chua I-Pin, a veteran of 17 years in the IT industry, has been promoted to vice president to lead its operations in Asia South. Victor Cheng, who has held this role since 2012, has left the company to pursue other opportunities. Based out of Singapore, Chua will be responsible for accelerating business growth, driving sales and expanding the company’s partner ecosystem across the Asia South region, which includes ASEAN, Sri Lanka, Bangladesh, Bhutan and Nepal. Chua reports directly to Ken Arredondo, president & general manager of Asia Pacific & Japan, CA Technologies. Mr. Chua was formerly from Oracle. Targus® Inc., maker of the world’s top-selling laptop computer cases and accessories, today announced its latest collection of CityLite II Backpacks. The CityLite II collection is the ultimate answer to any safety and protection need for your laptop. It offers a variety of security features to protect the backpack and its contents against rainy weather, tampering and theft, as well as to enhance visibility in low-light environments. Designed for travel and everyday use, each bag in the CityLite II collection is great for business commute, travel, and as a carry-on for airplanes. Viber, the leading mobile communications platform offering free messaging and HD-quality phone calls, announced today the release of Viber 4.1 for Windows Phone 8 bringing “Viber Out” calls to the platform for the first time. Now Viber users on Windows Phone 8 can make affordable calls to their friends and contacts who have landlines or phones that don’t have Viber. Additionally, the update brings several key Viber features to the mobile Microsoft platform. From the ocean of negativity surrounding Malaysia following the unfortunate incident of the missing MH370 flight, a Malaysian company, Just Mobile Sdn Bhd, cuts through the gloom to add some hope and positivity with a special tribute section on their eMemorial Facebook app (https://apps.facebook.com/ememorial). Dedicated to the crew and passengers of the flight, Just Mobile aims to encourage people to celebrate and honour the individuals involved - whose whereabouts are currently yet to be confirmed. This is a welcome move, especially now with the Malaysian government under fire for mismanagement of the unfortunate MH370 aircraft incident. “With the whole world pointing fingers and throwing blame all over, people are forgetting to be human – to focus instead on prayers and thoughts for the souls lost,” said CEO Melvin Wong. The app would give an online presence for the missing flight’s 12 crew members and 227 passengers – enabling friends, families and well wishers pay tribute and keep them in remembrance. Adobe today unveiled the findings of its ‘Education, Creativity and Employability’ study at the 9th annual Adobe Education Leadership Forum in Kuala Lumpur, Malaysia, from 31st March -2nd April, 2014. 1531 educators representing 13 countries across Asia Pacific were surveyed with an aim to gauge the importance of creativity in education and its role in building a digitally able workforce. Brocade today announced that it will play a strong role expanding the industry mindshare of Software-Defined Networking (SDN) and Network Functions Virtualization (NFV) as an exhibitor at Interop Las Vegas from March 31 to April 4, 2014. As a leader in the evolution of data center networking, Brocade will highlight how organizations can design tomorrow's network today and embrace the operational benefits of NFV and SDN. The popular social communications app WeChat just released its new, highly addictive mobile racing game, WeChat Speed. The top ranking game on the iOS App Store in the free games category after a day since its launch, WeChat’s wicked Speed game is fierce, fun and endlessly entertaining. Cutting-edge graphics and heart-pounding action give racers the ultimate thrill while competing against friends in a fearless car race. The jam-packed action starts as soon racers chose their competition, a car of their liking and the terrain which is most appealing. The goal of the racer game is to speed across the finish line ahead of all competition on the track, and be crowned the champion. Along the way racers will collect coins, hijack trucks, receive turbocharges, swerve helicopter attacks and be surprised with cool bonuses. Oracle Corporation has just launched its Oracle Innovation Management solution to help organization increase their return on innovation investments. The solution provides with bottom-up innovation so all stakeholders may participate in the product invention and definition processes, with simultaneous top-down financial impact analysis and strategic fit visibility to the key portfolio owners during and post investment decision. ISPM, a leading vendor of flexible, agile service assurance and management software for telecommunications and IT infrastructure announced that it has been nominated in the industry contribution category in the TMF Excellence Awards. The industry contribution award is presented to the member company demonstrating leadership, dedication and contribution to the Forum’s strategic collaboration programs, and the future of the industry as a whole. IBM today announced plans to commit more than $100 million to globally expand its consulting services capability to help clients with experience design and engagement. As part of the investment, the company will open 10 new IBM Interactive Experience labs around the world and plans to add 1,000 employees to create new, personalized models of engagement through data and design. Located in Bangalore, Beijing, Groningen, London, Melbourne, Mexico City, New York, Sao Paulo, Shanghai, and Tokyo, the new labs provide clients with the opportunity to work side-by-side with researchers and consultants as well as experts in experience design, mobile and digital marketing. These multi-discipline teams analyze business challenges and jointly create solutions that integrate next-generation mobile, social, analytics and cloud technologies. TheStar reported a paradoxical reality facing modern aviation industry where high-tech planes rely on ageing ground infrastructure for information. 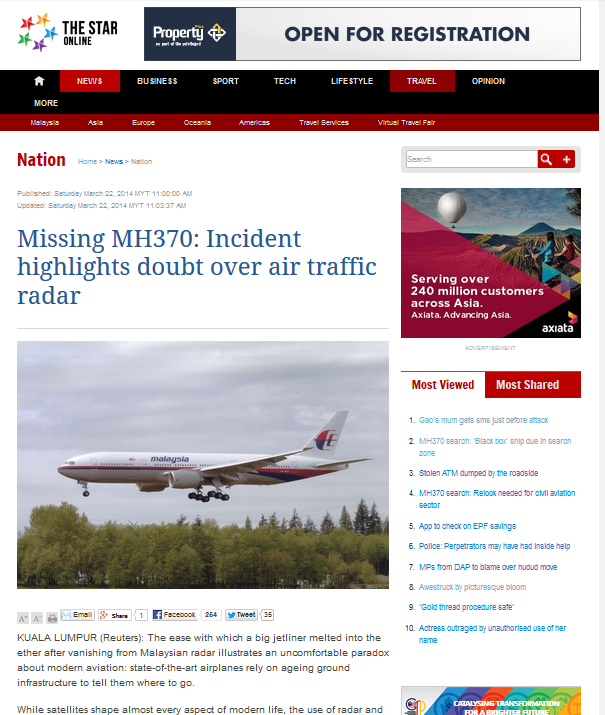 The report highlighted that the use of ground radar and radio system hasn't changed much since commercial airplanes was first flown. 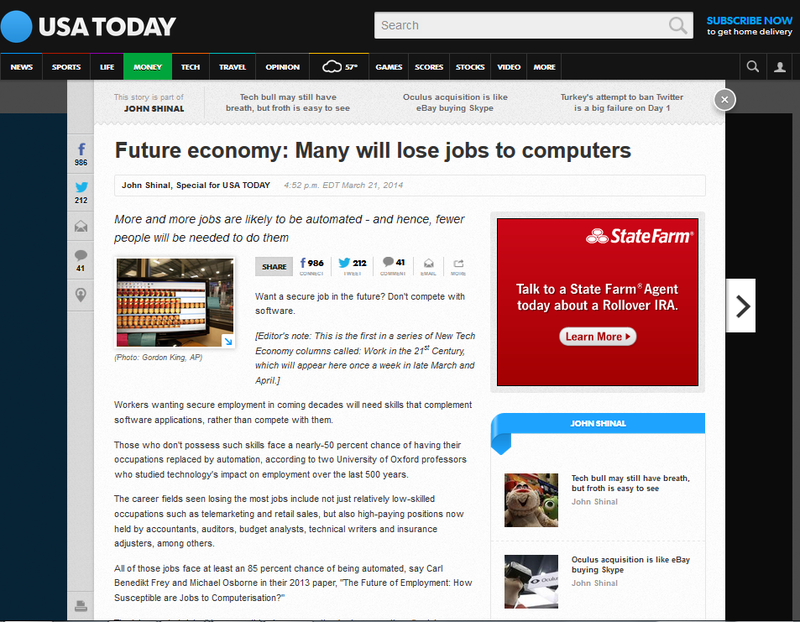 A report by USA Today highlighted the gloom future of modern society which faces the prospect of losing out to computers, not just affecting jobs such as telemarketing and retails sales, but also affecting jobs which are bounded by well-defined procedures such as accounting, auditors, budget analysts, insurance adjusters and etc. The report was a summary of studies by two University of Oxford professors. 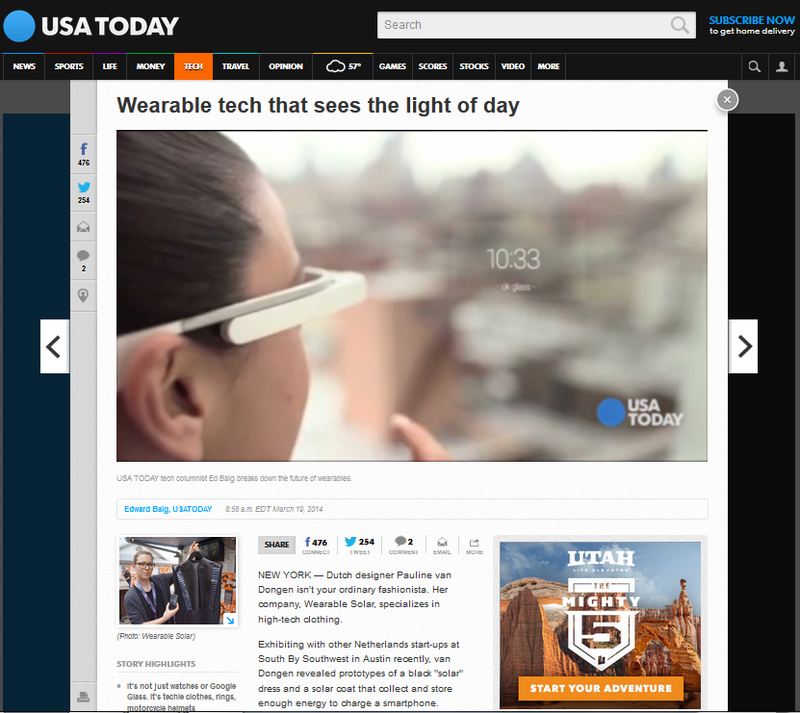 A report by USA Today highlighted a series of wearable tech(s) which prove to be marketable. For example: wearable solar clothing by Dutch designer Pauline Van Dongen, collects solar energy to charge smartphones. It works by having concealed solar cells inside the clothing. The cells only need to be exposed to sunlight for an hour, after which will gather enough energy to charge up smartphones by 50%. 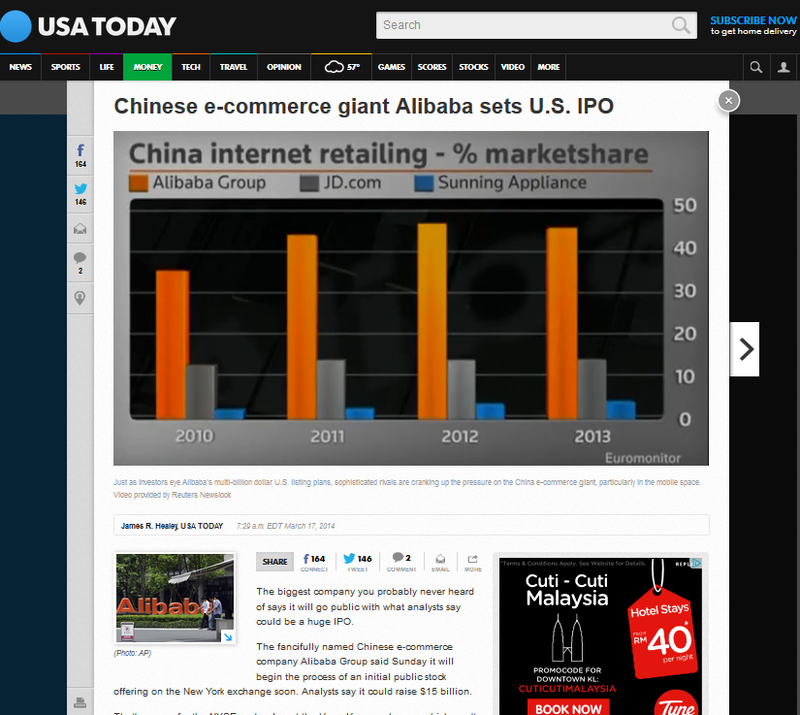 A report from USA Today highlighted that that Chinese e-commerce giant Alibaba announced it will begin the process of IPO on the New York stock exchange soon, estimated to worth $ 15 billion. 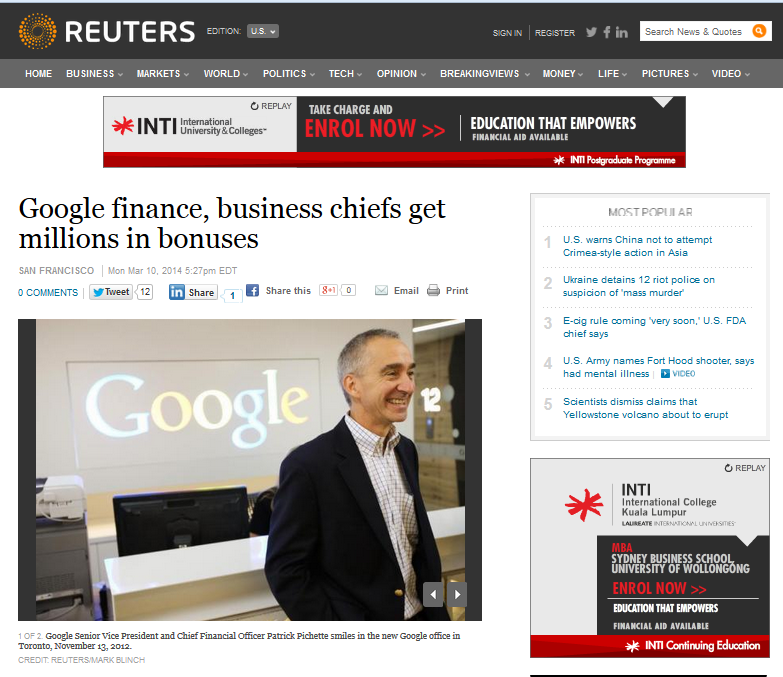 A report from Reuters highlighted that Google will pay Finance Chief Patrick Pichette a $3 m annual bonus, Chief Business Officer Nikesh Arora a $ 3.5 m bonus, following a stock surged by nearly 60% over the financial year period. 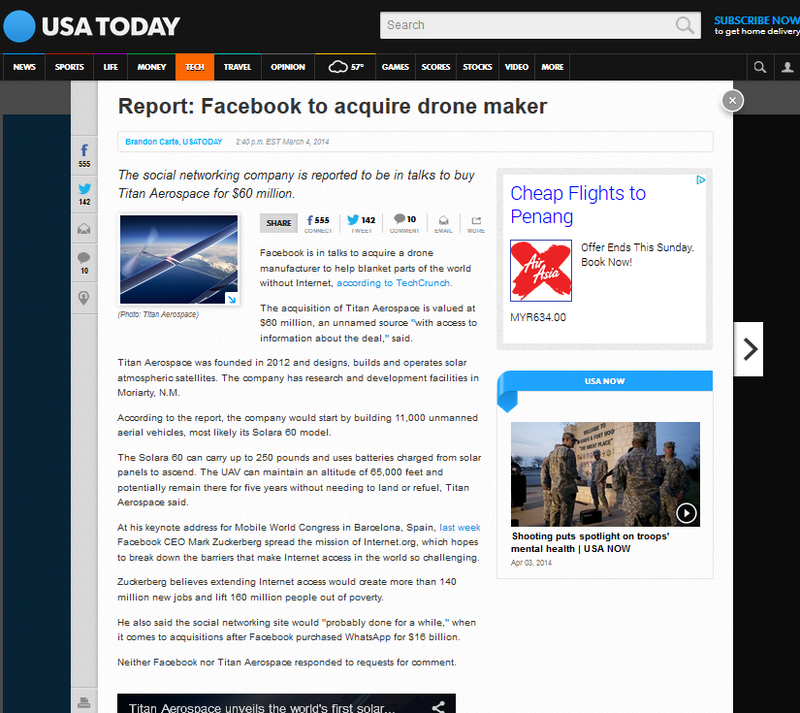 USA Today reported that Facebook was negotiating to acquire a drone maker in its effort to provide Internet coverage to other parts of the world where Internet connection stills doesn't exist. Titan Aerospace, which build Solar-based drones, is said to be worth $60 million in the deal.